I think that effectively teaching a spirited child to read boils down to one thing: Don’t teach her to read. Yes, you read that correctly. Don’t try to teach her to read. 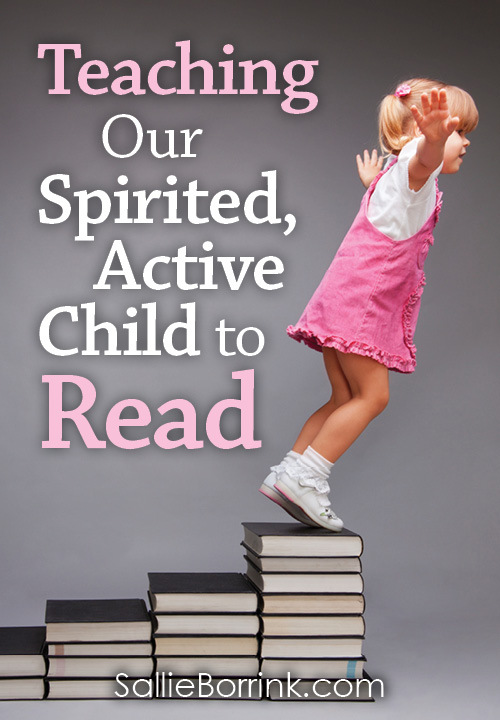 Allow the child to teach herself to read. Caroline constantly amazes me with her reading. She amazes me because I have done relatively little direct instruction with her and so I’m somewhat taken aback at how much she knows. To be sure, David and I have done a great deal to invest in her developing ability to read. Probably most importantly, we have read multiple books to her every day since she was around six months old as part of our desire to raise a reader. The power of reading a variety of books every day to your child cannot be overstated. We surrounded her with print material including books and subscriptions to magazines such as Baby Animals (Now Highlights Hello) and High Five (Thanks, Mom!). But we have not “taught” her how to read. She has taught herself so much that I can’t point to a curriculum and say, “Caroline knows these words because we’ve learned them and I’ve tested her on them.” This summer we were out driving and another car had one of those baby screens in the back window. She said, “The First Years.” I had no idea she knew the words “first” and “years” but she obviously did because she read them with absolutely no supporting context at all. She basically does this every day. Every day I discover another group of words she knows that she learned somewhere. When I realized Caroline was a spirited child, I knew I had to rethink every aspect of my educational philosophy in light of the child I had been blessed with by God. I’m a former teacher and I had thought a great deal about homeschooling while waiting to be blessed with a child. But none of that really mattered. I wasn’t trying to figure out how to teach a class of twenty-five first graders to read. I had one child to consider. Mine. And it really didn’t matter which curriculum choices sent my heart racing with possibilities. It only mattered what would get Caroline excited about learning. So I had to rethink all of my approaches in light of my child. Some of my views would remain the same, some would adjust slightly, and others would take me in completely different directions. One of the realizations I had early on was that any thought of the two of us sitting down and me “instructing” her how to read was simply not going to fly. She wouldn’t sit still that long and it isn’t how she functions best. I knew we would both be miserable. She learns best by watching and acting. So I made the choice to embrace two mediums I would not have expected: DVDs and websites. Caroline didn’t watch TV or DVDs until she was almost two years old at which time I started to let her watch Baby Einstein videos. She loved them and we used them as an educational tool to foster discussion about all kinds of topics. Yes, they also worked as an excellent babysitter to give us a break. But we just didn’t let her watch them without also discussing them, connecting them to her real world, etc. So, for example, Baby MacDonald – A Day on the Farm (the “Cow” video as it was called in our house) was connected through other books we read, toys we bought, and regular rides we took in the countryside to help her see in person what she was seeing on the television. The other biggie has been Starfall. We also subscribed to the More Starfall when it became available. Some of the stuff on Starfall is hokey and cheesy. There is stuff on there that makes me wince at the dubious artistic quality. But Caroline learned so much from Starfall and More Starfall. We’ve also subscribed to ABCMouse.com for a season and are utilizing ABCya.com. But Starfall has been the biggie. Now there are ways that I will have to teach Caroline. She definitely needs work on the long vowel sound patterns and so we will practice those. We’ll play games with word families. I utilize the pocket chart and learning games as much as possible. I do everything I can to get her to read without it being obvious that we’re working on reading. But it is soooo much easier because all of the foundation is there. I just work at filling in the holes and not trying to build it from the ground up. Drilling her and working on sight words from scratch would have been an exercise in frustration for both of us. This is much better. I’ve been quizzing her on the Fry’s First Hundred Words to see what she knows because I honestly wasn’t sure. She basically already knows all but about ten of the first hundred words that are supposed to be learned in first grade. We started going through the second hundred words for second grade and I’m guessing she probably already knows at least a third of them, probably more. I’m going to check her on the third grade words as well. I’m guessing just by looking at them she already knows quite a few of them as well. Back to the DVDs… The other DVDs that we’ve utilized have been the Little Einsteins (such as Flight of the Instrument Fairies, Team Up for Adventure , and Our Big Huge Adventure ) and Curious George (such as Curious George: Back to School , Curious George Makes New Friends , and Curious George Goes to the Doctor and Lends a Helping Hand ). (We purchase all of the DVDs in both of these series and she has enjoyed them over and over and over and over…) The thing that I like about both of these series is that they have a learning component, but they also meet her need for creativity and fun. She has such an imagination and these two series really seem to feed it for some reason. The Curious George videos have a real life segment at the end of each episode that shows real kids doing real things related to the topic. These have been a great springboard for further discussion or projects. So there’s a little bit about how we’ve “taught” Caroline to read. 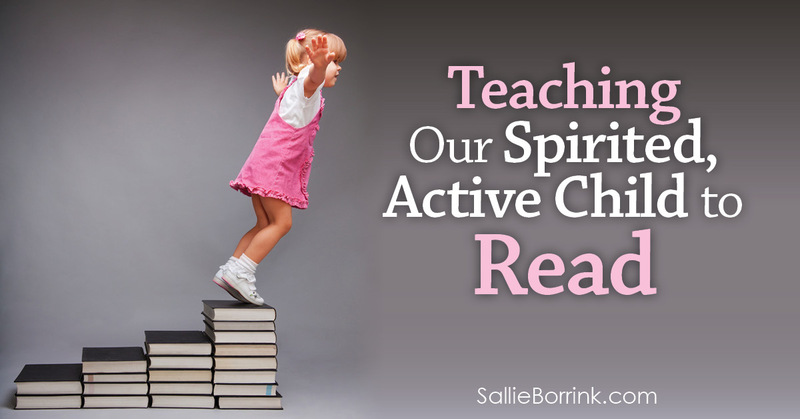 Will our method work for every spirited child? I have no idea. But I do know that spirited kids who are more of everything need a different approach to much of life. This is what I discerned about how to handle the reading aspect. It was a big shift for me because I tend to be rather low enthusiasm on the technology front. I think it has its place, but I’m not interested in getting sucked up into it. But I know this was the best way to approach reading with Caroline and I’m just thrilled so see what a great job she is doing. It also fits well with our philosophy of making all of life a learning experience. Caroline taught herself to read through the tools we gave her in our home (books, games, DVDs, computer, reading aloud, library visits, etc.). We have shown her that learning happens all the time and she can embrace learning on her own as well as with us. We have empowered her to read and we reinforce that every time she reads something and astounds us yet again. Her reading is her own, not something we gave her. And that is a powerful lesson for her to begin learning even as a first grader. I’ll try to follow up with another post with some of the other reading resources we’ve used (games, books, etc.) and maybe even a post about how we are rapidly becoming semi-structured, semi-unschoolers. Great post! My right-brained, spirited, active child also has dyslexia. She definitely would teach herself to read, except, she can’t. If you have any resources, I’d love them!